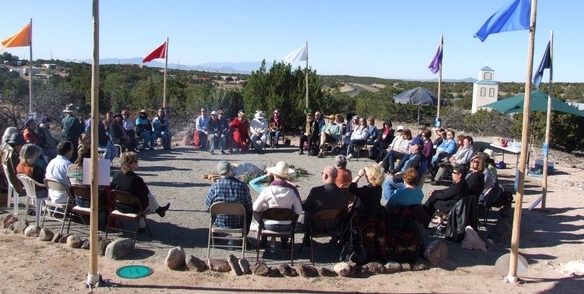 Unity Santa Fe offers beautiful, outdoor sacred spaces where you can commune with nature, offer ceremony, walk, drum, sing - be with your glorious Self, and others. We have a Medicine Wheel, Relationship Labyrinth and Meditation Garden. Our Medicine Wheel, based on the Mayan tradition, was created over Memorial Day Weekend 2010, under the sacred direction of WindEagle and RainbowHawk of Ehama Institute and 50 members of our commUnity. The weekend culminated with Interfaith blessings from eight different spiritual disciplines in honor of the eight directions. Native Americans say the Wheel is the earth’s navel and connects us to Mother Earth. It is a portal of prayer that we walk through being mindful of our Divine connection. It is important when you first walk into the Medicine Wheel to enter from the East (signified by the yellow flag) between the two gateway rocks, and as you do, to say a prayer “For All Our Relations.” Remember your ancestors before walking in, and walk clockwise in a respectful fashion. There are crystals planted in the earth around the Wheel that were mined with the intention of Peace, starting with Black Elk’s “Inner First Peace” and an intention for World Peace. This is our sacred prayer intention to mend the Sacred Hoop of All Creation. 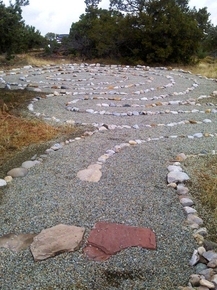 Len Meserve created the design for this labyrinth, dowsed its’ location, and with a team of Unity Santa Fe volunteers, built it in 2001. The design combines the wave and the spiral – forms intrinsic to nature. Waves and spirals both generate energy. When a wave moves towards shore it rises up and falls forward, creating a spiral form. The spiral is symbolic of evolution and infinity. As you enter this labyrinth you turn counterclockwise, the direction of storms in the northern hemisphere. Storms scatter, disperse, and destroy. When entering the labyrinth you release. In the center of a well-formed storm (a hurricane) you have the eye of the storm, the still-point. Here in the center of the labyrinth is an egg shape. Symbolically the egg is the vessel that contains all possibility, and represents new cycles, and new life. Spend time in the center in stillness and openness to receive what is yours to receive. When standing in the center of this Labyrinth there are three paths on one side of you, symbolic of heaven, and four paths on the other side, symbolic of earth. You are the temple in the middle that unites heaven and earth. Within the human the finite and the infinite are united. When exiting the labyrinth you walk in a clockwise direction, the solar direction in the northern hemisphere. This spiral direction has generative and creative energy. We take what we have received and birth it in the made-manifest world. Choose whichever side you want to walk in on and then walk out on the other path. There is no ‘right’ way to walk a labyrinth but these are some suggestions. Focus: Pause and wait at the entrance. Become quite and centered. Give acknowledgment through a bow, nod or other gesture and then enter. Exit: Turn and face the entrance. Give an acknowledgement of ending. Reflect: After walking the labyrinth reflect back on your experience. Use journaling or drawing to capture your experience. Make yourself comfortable on one of the benches as you commune with nature amidst the pinon and juniper trees, wind chimes, and angels. Feel your Oneness with All That Is as you practice awareness of the Divine Presence within you. Our meditation garden began as a memorial garden honoring members of our spiritual community who have left our physical presence but not our hearts. As you sit here perhaps you will remember a loved one who has left the earthly plane. Or simply sit in the silence and feel the joy of being alive. Meditate: Move into a deeper awareness of God. "Be...Still...and Know...."